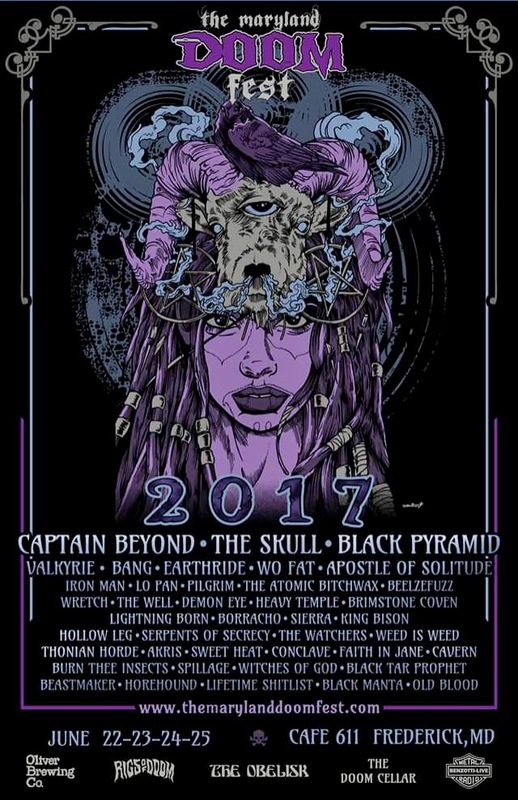 Beastmaker has announced that they will be unable to make it to this year’s Doom Fest. Borracho is still slated to be there Thursday night! Here at Valley of Steel headquarters, we’ve been trying very hard to bring you quality reviews almost every day (sometimes two at a time!) as a public service, so that you, the reader, get the opportunity to check out as much new music as possible. Hopefully some of you folks out there appreciate that, and you’ve managed to discover at least one thing you’ve really enjoyed after reading about it here. Well yesterday there was no new review (but as a side note, for those who live near Pittsburgh, have you entered yesterday’s contest for Chelsea Wolfe tickets yet? — And as a side side note, have you also entered our other current giveaways, for Baroness or Thy Art Is Murder yet?? ), so to make up for that, today we’re presenting an unprecedented quadruple review!! …Ok, ok, that’s not exactly how this came about — the truth is, just a couple of days ago, we received word that Failure Records had a special release lined up for this year’s Record Store Day (which is this Saturday, the 16th! ), a split record featuring a pair of songs each from Lafayette, Indiana’s The Mound Builders and Pale Horseman from Chicago. And the second of those names really rang a bell, because over the past few years Valley of Steel has received a total of three albums from that band — all good ones, too — but somehow we just never have gotten around to writing about any of them. Until today. Sit down and buckle up, because we’re about to cover all of it. “Now it’s time for YOUR Classic Rock” says the title at the top of Ripple Music‘s website, and the slogan is fitting: since its formation back in 2010, the label has made a name for itself as one of the premier sources for stoner rock and metal, psychedelic rock, and all things fuzz-laden. We’ve talked about some of their releases in the past, for example here and also here, but more generally, the label has come to be known for putting out music of consistent quality, within the circles of those styles. And now (starting last summer), they have begun a brand-new series of 12″ splits called The Second Coming of Heavy, which so far has featured some pretty serious heavy hitters, with plenty more on the way. Today we’re going to take a look at the first two of these, Chapter One which came out nearly eight months ago, and Chapter Two which hit the streets at the end of February. Hey, guess what. It’s Monday. Another weekend concluded, another work week begun. By now, you’re all surely well aware of my Garfieldian opinions about Mondays (also, mornings; also, lasagna), so I see little point to continue any interaction with that particular decreased equine. So let’s change the subject, because we all know you’ve come here to hear some music, not to read my grumpy mutterings. It’s been over a year since we last checked in on our favorite D.C.-area stoner/fuzz rockers Borracho, so it’s probably about time for an update there. Borracho Kick Off Their First-Ever European Tour! Okay folks, you know the drill by now. I’ve been talking about Borracho for years. Obviously I’m a big fan of these Washingtonian heavy-fuzzy-stoner-riff-rock dudes. And I’ve seen them every time they’ve come to Pittsburgh (twice in 2013, and then a third time about a month ago). But despite all that, at their most recent show (22 March 2014 at The Shop, along with Neon Warship from Dayton, and Pittsburgh’s own Carousel), they somehow managed to exceed all my expectations. All three guys seemed to be on fire that night, and the crowd seemed equally enthusiastic. If this trio is bringing that kind of energy with them across the Atlantic, I fully expect they’ll be making some huge waves all over Europe in the coming week and a half. Scroll down for a full list of their across-the-pond tour dates.